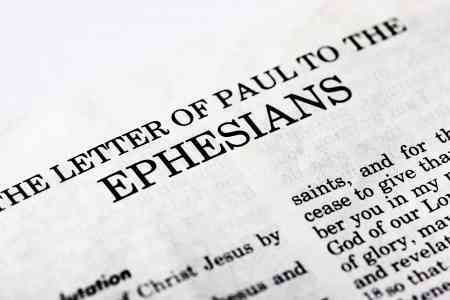 The book of Ephesians is 6 chapters of solid Christian teachings! From chapter 1 to 6, in that order, you will read about: spiritual blessings in Christ, thanksgiving and prayer, grace through faith, being one in Christ, the mystery of the gospel revealed, prayer for spiritual strength, unity in the body of Christ, new life, walking in love, wives and husbands, children and parents, slaves and masters, and putting on the whole armor of God. Let us dive into this book and gain some insight on 21 important verses that were indeed written by God through man. (2 Timothy 3:16) In this article I am going to follow the book from beginning to end starting in chapter 1. I am using the headings above so you can follow along with me. The book of Ephesians is 6 chapters of solid Christian teachings! Think of yourself as a slave. Paul calls himself a “servant of Christ Jesus” in Romans 1:1. This word is correctly defined as “slave” also. Therefore, being a slave to Christ means living out Ephesians 6:5-6 for all believers. I encourage you to read about the armor in more detail for yourself at the end of chapter 6. May you be strengthened and encouraged always through the Word of God! God bless you as you continue to live a life worthy of the calling! Thank you Derek. It is always refreshing to read your articles. Could you please expand on the “Mystery” of God. I had forgotten about the Gentile connection in Ephesians. I had always grabbed unto Colossians where Paul speaks of the “Mystery of God” being God in Christ and Christ in us(Col 1:27). It seems that Paul here speaks also of the Gentile connection. It would seem (to me) that in Ephesians and Colossians Paul is trying to convince the Jewish believers that the Gentiles are included in God’s plan of redemption and that it is not a “Jews only” club. Do you see the “Mystery” as that or do you see it as CS Lewis said as the “Mystery” being simply ‘The Gospel”, which is “God in Christ and Christ in (every) believer”? As for the “Mystery” I believe it is about the gospel that was somewhat cloaked in the Old Testament. Abraham knew that in his seed “all nations would be blessed” but it was not fully known just who and how this would occur. I believe that the “Mystery” may be that we can now see clearly the redemptive plan of God thru Jesus Christ and by the illumination of the Holy Spirit, the plain things can be made clear only by God the Holy Spirit showing us Who Christ is and how we might be saved. As you said Doc, “The Gospel”, which is “God in Christ and Christ in (every) believer” was a mystery solved, with much more clarity on the day of Pentecost when the Holy Spirit came upon the church and upon believers to point us to the only way to eternal life (Acts 4:12) and that is in Jesus Christ alone. In the O. T. we saw thru a glass darkly but now Jesus is plainly seen by the revealing work of the Spirit. Well said Jack. Thank you! Hello again DocReits! Thank you for your kind words and your question. I think Jack did a wonderful job at explaining this so I won’t say too much more. I would like to point out that the reason it is a mystery is because Israel was the chosen nation in the beginning, but now through Christ crucified and the coming of the Holy Spirit we all are now called children of God if we have chosen to embrace Christ and follow His lead as we take up our crosses daily. In Ephesians 3:9 Paul explains that God sent him to bring light to everyone as to what this mystery is. The very next verse says why God did this through Paul, “So that through the church the manifold wisdom of God might now be made known to the rulers and authorities in the heavenly places.” I believe that God brought this mystery to completion for the host of angels in heaven. Remember that in Genesis it is shown that angels even have “free will”. Satan was the most beautiful angel that God had created and he chose his own path, which God could not accept. And 1/3 of the rest of the angels sided with Satan and they were all banished to hell. I believe this mystery was given and revealed so that the angels in heaven would say, “Yes God! You are in control of all things! You have brought Your chosen nation of Israel together with the Gentiles to form one body in the church, and your church is waiting for its precious bridegroom to come back and take her away to the honeymoon of a lifetime in heaven!” So, as you can see, I think there are 2 answers to this mystery: one is the answer Jack gave (earthly realm) and the one I have given (heavenly realm), which goes to show that God indeed is in everything from every single planet all of the way into heaven. This mystery proclaims His glory into all of eternity! Jack thank you for your suggestion. It was as you say “spot on” with what the Bible says. I thank you for your knowledge and insight as always brother! God bless the both of you! DEREK , DO YOU THINK MAYBE SOME NON- CHRISTIANS ARE WHAT THEY ARE JUST OUT OF MAYBE PREJUDICES — LIKE WHY SHOULD I BELIEVE IN THIS GOD OF THE JEWS , IT WAS LIKE THAT IN THE BIBLE , I GUESS THAT IS STILL IN EFFECT TODAY TOO ? YOU HERE WARS ARE ALWAYS OVER LAND , RELIGION , OR PREJUDICES , I GUESS I KNOW WHAT YOUR ANSWER WILL BE , BUT I LIKE THE WAY YOU SAY IT BROTHER , YOU GOT TALENT . Hi Nicholas. If I am reading your question correctly, than these non-Christians are using excuses to condone their actions, beliefs and behaviors. This is a weak mindset. We should act, think and believe in things with confidence, research and study. We should never use other people to excuse our way of life. Does that make sense? Jesus could have easily bypassed crucifixion with the excuse, “I am perfect and sinless. I should not be the one to die for these generation of sinners. They have dug their own graves.” I praise the Lord that Jesus fought the good fight all of the way to the cross for us. He did it because it was what should have been done, and He did it with no excuses. I hope this helped you! God Bless! DEREK , I AGREE OF COURSE , I WAS JUST SAYING THIS LIKE THE NAZI’S DIDN’T LIKE THE JEWS AND KILLED THEM , WERE THEY JUST MORE OR LESS PREJUDICE TOWARD THEM AND NO OTHER REASON ???? Previous post: Do Christians Go Immediately to Heaven After They Die?